Flowing off the backwaters of India’s Malabar Coast is Kerala — a region popular for its picturesque waterways, coconut groves and paddy fields that expand down the coast. With backwaters stretching 900 km long, the palm-lined network is interconnected by canals, lagoons rivers and lakes. The Kerala Backwaters offer visitors a look into the traditional rhythm of village life that can’t be found in the city. Here is where you’ll find ferry men carrying villagers in canoes, women in saris walking by the river, floating grocery stores and a fresh take of a slower way of life in India. Take a peaceful ride along the quaint backwaters of Kerala, watch the sunset and the moon glisten beneath the surface. Ride along some of the best uninterrupted backwaters and let it take you on a magical escape along India’s southern coast. Alleppey is known as the “Venice of India.” Rich in cultural history and steep in tradition, the city of Alleppey depicts a raw and genuine look of life in Kerala. Alleppey is one of the rarest places in the world where agriculture takes place below sea level. You’ll find charming rivers, endless palm groves, boat races and houseboats that line the Alleppey backwaters. 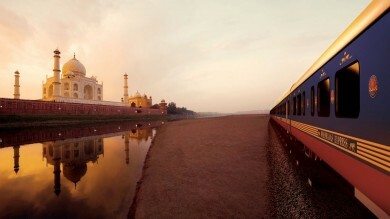 How to get there: Take the train from Cochin. Or board a state-run bus from Trivandrum or Cochin. On the southern end of the region is where you’ll find Kollam, one of the oldest ports in the Arabian Sea. The entrance way to the renowned backwaters of Kerala, Kollam is home to a unique array of seas, mountains, rivers, forests, plains and vast green fields that give Kollam its name as the “dreamland of Kerala.” You’ll discover the expansive and calm waters of Ashtamudi Lake, aligned with coconut palms and cashew plantations that float among the many villages that rest along the waters. How to get there: The most direct way to reach Kollam is by bus from the Trivandrum Airport, about 70 km away from Kollam. Surrounded by hills and the sea, Kuttanad’s waterline is filled with rivers, canals, lakes and rivulets flanked on both sides that meet in the middle. With renowned paddy fields of yam, cassava and banana making up most of its cultivation — Kuttanad backwaters leave lots for travelers to see. How to get there: The quickest way is by flight from the Cochin or Thiruvananthapuram International airport. Kerala’s largest city, Kozhikode was once the capital of the Zamorin dynasty. Overlooking the Wayanad hills, Kozhikode is known for its distinct beaches, emerald green shores and flourishing history. 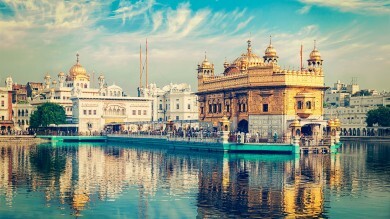 The city was once a major trading hub for India. Among them, international trade of pepper, coffee, lemongrass and rubber are still central to the way of life in Kozhikode today. 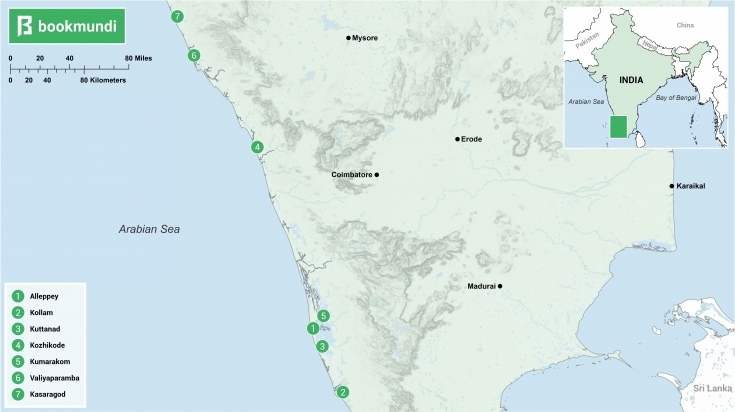 How to get there: Kozhikode is well-connected to many surrounding cities. Reach it by car in around 7 hours from the closest city of Mangalore. Formed by little clusters of islands on Vembanad Lake, the village of Kumarakom is part of the Kuttanad region. Once you enter, you’ll be welcomed by mangrove forests, massive coconut trees and a mighty blue lake. Kumarakom is home to a 14 acres bird sanctuary and some of the most scenic waters of India’s southern coast. How to get there: Take the state highway from Kottayam, which is just about 16km away from Kumarakom. A long strip of land stretching between the backwaters and the Arabian Sea is where you’ll come upon Valiyaparamba in northern Kerala. Valiyaparamba is created by four separate rivers that meet and weave around a group of little islands in the middle. Founded close to the area of Bekal Fort, Valiyaparamba’s unexplored islands give a sense of seclusion to its visitors and a fully immersive retreat with nature. How to get there: Take a ferry from Payyanur that’ll take you through the beautiful Kerala backwaters to Valiyaparamba. Situated on the northern tip of Kerala, Kasaragod is a city of abundant landscape and history. Surrounded by the Arabian Sea and the Western Ghat, twelve rivers form the natural landscape of Kasaragod. With lush green fields and turquoise blue waters, Kasaragod’s distinct flavor lies in the many mosques, churches, temples, and forts that fill the heart of the village. How to get there: Take the national highway (NH17) from Kumbla, which is 14km from Kasaragod. The climate of Kerala is rather mild and a popular all-season destination. Nevertheless, October to April is considered the best time to visit with moderate temperatures and vegetation at its finest state. The Kettuvallam, known as "boat with knots", are boats held together by coir ropes and huge planks of wood that make the entire structure of the boat. 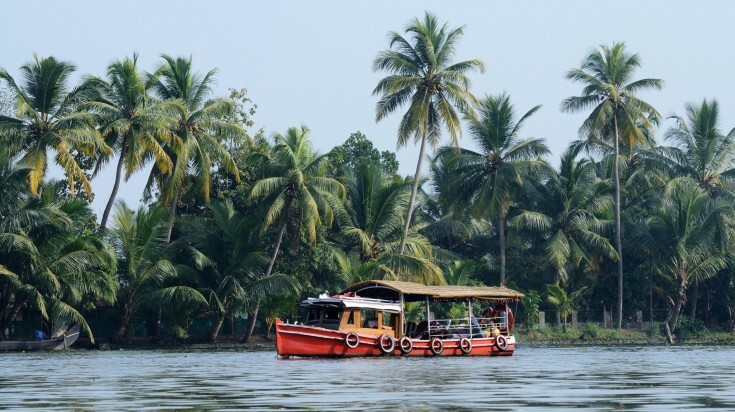 What to expect: A complete, classic way to explore the local scenery and backwaters but also remain close to the villages and vegetation that give Kerala its quaint appeal. It also gives you a peek into the life of a villager back in the day, where kettuvallams were once used as a mode to transport goods from village to village. What is included: Touring on a Kerala backwaters houseboat is similar to a full-scale hotel floating on the sea. Houseboats come with rooms, attached toilets, kitchens, and even a viewing lounge. Ride the backwaters under a thatched roof and a historic way of transportation that has been in practice for many years. Cruise times are fairly limited and the costs are similar to what you’ll get for a hotel room. Tourist ferries offer a scenic route down the backwaters through Alleppey to Kollam. Ferries leave daily and make it the perfect day-trip. What to expect: A ferry tour takes 8 hours and will take you down the main waterways of Alleppey and down to Kollam. You’ll stop at some villages along the way where you can grab lunch from the locals and continue on your journey. What is included: Tourist ferries are simple and include options to sit on the upper or lower deck among other travelers. This is a great option for those on a budget but still want to experience a tour along the waters. A perfect day trip that carries you along the waterways, hitting many of the major sights along the way. The ferry stops at Matha Amrithanandamayi Mission, a monastery for India’s only female spiritual leader. Tourist ferries traverse only through the main wide canals. So, a better look into the villages that are located off the main canal stream may be missed. Take a kayak and head over to the waterways that aren’t possible for houseboats and explore the back door of the Kerala backwaters. What to expect: An intimate way to tour the backwaters along the narrow channels and reach floating houses off the beaten path. Observe life from close quarters and watch people as they go about their daily life — parents taking their children to school, villagers buying fish and women strolling down the banks to collect water. What is included: A guided kayak tour through canals that cannot be toured by boat. Tours usually last four hours and include light refreshments on board. Kayak closer to sunset and navigate the channels while watching the sun disappear among the palms and rich sea. Kayaking calls for physical activity and much movement to get from one place to another for long periods of time. It may not be wise for travelers that wish to sit and relax. 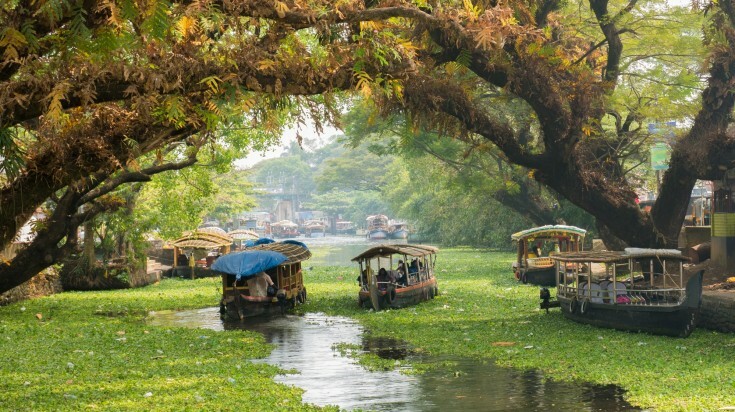 A shikara, also known as a motorized canoe, allows travelers to head into very small channels and experience the backwaters on paths less traveled. What to expect: Since a majority of tourists opt for a houseboat tour, a shikara is a great way to view the sights and see the villages without the crowd. Explore the waters through small waterways and channels in close proximity to the village locals. What is included: A private tour of the backwaters on a shikara, with a guide that’ll take you to the many villages along the waterline. Shikaras are rented by the hour and aren’t usually shared. Adventure closely with village folk and personally meet the community that makes up Kerala. Renting a shikara is affordable and is perfect for those that prefer a more local view of the backwaters. Touring on shikaras are weather dependent and not meant for heavy winds and rain. A Kerala backwaters tour cost on average is around USD 70 – 150*, depending on the type of tour you choose. Tours can last anywhere from 4 hours to 3 days. Overnight tours are usually on houseboats that offer 2-day up to 7-day tour packages. 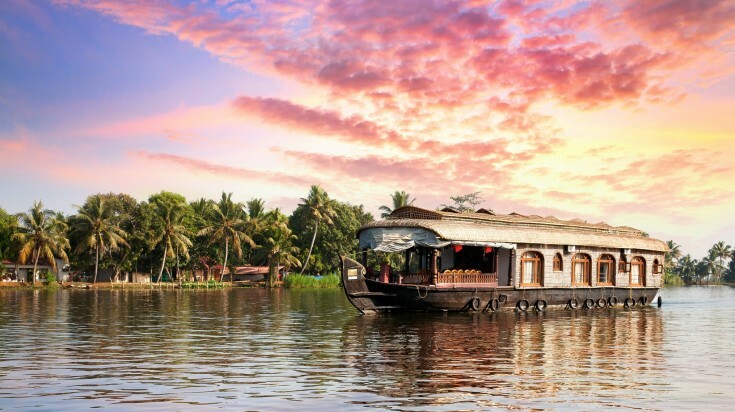 One of the most popular tours in Kerala is exploring the scenic backwaters of Alleppey in a houseboat. Houseboats provide all the basic necessities, while giving travelers a way to relax and fully experience the charm of the region. If you’re up for an adventure, a highly recommended tour would be discovering the best of what Kerala has to offer. Many tour groups provide packages that take you all around Kerala — from the islands in Alleppey to Munnar, Kovalam and to the capital city of Trivandrum while stopping at the many historical sites and forests that Kerala is famous for. 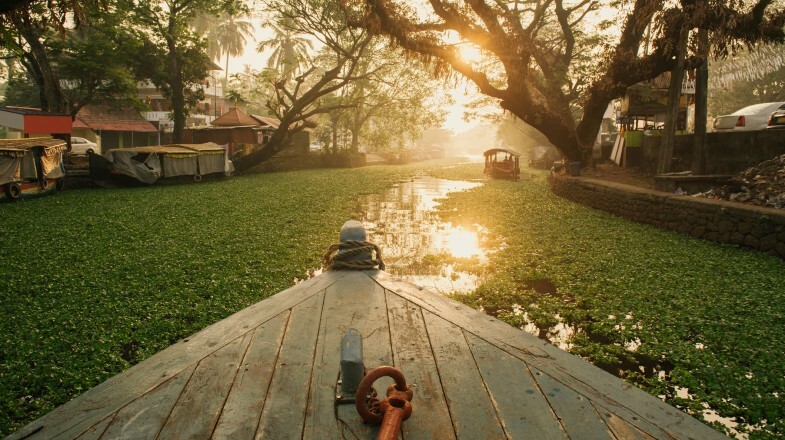 The Kerala backwaters are one of India’s most sought-after views. It’s a place of adventure that presents travelers a way to retreat from the bustling city and absorb in the culture, nature and slow living of everyday village life. You’ll get so entranced in the way people move among the waters that you may even find yourself not wanting to leave.